The exam development process for the Certified Employment Support Professional (CESP™) certification is important to understand, as the process ensures that the exam continues to reflect the scope and purpose of the program and remains aligned with the field’s knowledge and skills. In keeping with generally accepted psychometric, education testing practices, and national accreditation standards for certification programs, the Employment Support Professional Certification Council (ESPCC) participates in, and provides oversight for, the development and ongoing maintenance of the CESP™ examination. Exam development is being led by the (ESPCC), and will continue over the next few months. A job analysis is conducted regularly to serve as the basis of the exam and its content. 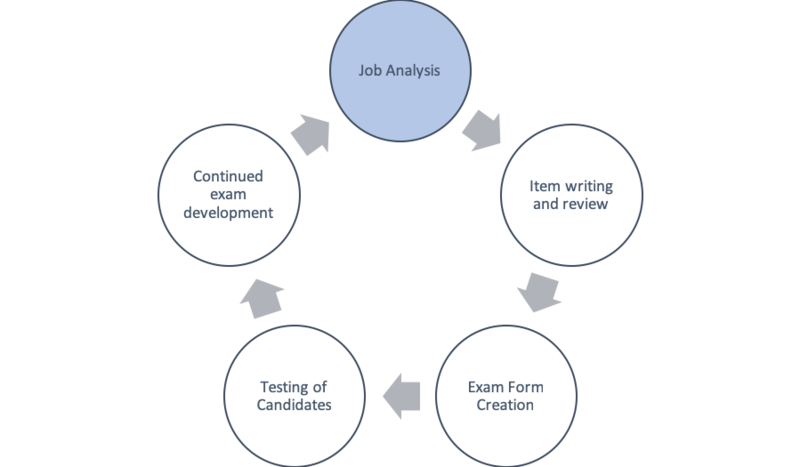 This process ensures that items tested on the exam are consistent with current practices used by employment support professionals and contributes to test validity. An executive summary of the job analysis is posted online (click here to view PDF document). The most recent CESP™ job analysis was conducted in 2018 and resulted in a new content outline for the exam (click here to view PDF document, effective for exams beginning in August 2019). The new content outline is the basis for developing new exam forms and exam questions. The current content outline for the examination currently in use is available online here or in the Candidate Handbook. We will continue to provide updates about exam development, including item writing, exam form development, and upcoming testing updates.